It’s always busy in advance of exam season at the University of British Columbia. But for senior statistics student Tomas Zhang, it’s even busier. That’s because Zhang has to not only work on his own exams, but he also spends 12 hours a week helping some Chinese first-year and second-year students prepare for their finals. Zhang is not alone. He is just one of the growing numbers of tutors working at Mandarin tutoring services for Chinese students at UBC, as they struggle with working in their second language, culture shock, and a shortage of help from the university. Many have sensed the opportunity to make a fortune from these struggling students. They set up centres by seeking out graduate and undergraduate students who can work for them as tutors. Then they organize both one-on-one tutoring and big classes for students taking common core courses like math, physics and economics. The tutoring centre was established last year; its main focus is helping undergraduate students. Fifty tutors from UBC have registered at the centre. Students pay $30 to $40 an hour for tutoring service. China is by far the biggest source of international students for UBC. Chinese students account for 36 per cent of all 8,984 overseas undergraduate students at UBC, according to the 2015 annual report on enrolment. In 2010, there were only 808 Chinese undergraduate students enrolled. But for many of the newly arriving students, the risk of failure is high. At the Sauder School of Business, one of the most popular schools for Chinese students, the dropout rate for the 300 students who enter first year is 15 per cent, compared to 10 per cent for the general student population. One of the biggest difficulties for Chinese students is the language barrier. Many of them don’t always understand the lecturers in the classroom and they are afraid to speak out in class. Their papers are often written in ungrammatical English. The solution, for many, is to get tutoring help in Mandarin. But it has become a competitive market. Search “UBC tutor in Vancouver” in Chinese on Google, and a dozen websites will show up. Simon Yang, a second-year undergraduate student from the UBC Sauder School of Business, is thinking about paying for advice about his writing. He already found a Chinese tutor for an economics course which he had trouble with. Yang has been overwhelmed with the culture shock and heavy course load since he came to UBC. He is ashamed of the fact that he still can’t express himself well in the second year. He can ask the lecturer and teaching assistant for help after class, but their free time is very limited. UBC has a writing centre, but it is mobbed with students like Yang and often it’s hard to get help in time. 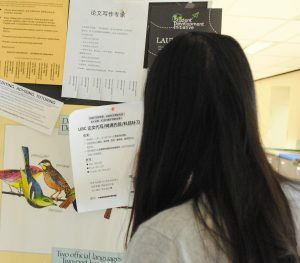 A Chinese student looks at posters on a campus bulletin board claiming to provide tutoring and writing services. One touchy subject with tutoring services is whether too much help is provided. But Joseph Chan, a graduate student at UBC from Singapore, claimed that he got a phone call from a tutor centre asking him to write essays for their clients. “Ghostwriting has a very big market, you will earn a lot,” Chan was told. But he refused. Instead, Chan charges for writing advice and helping correct grammar errors for Chinese students.